For 146 years, Wellesley has been a place for women to be inspired, learn, engage and connect. We are a community defined by a unique set of traditions, experiences, places, friendships and lifelong connections. For the past several weeks the community, including hundreds of students and alumnae spanning eight decades, have been sharing their favorite things about the College. These favorites, along with welcome wishes, are being collected and displayed on a new microsite. Ultimately, they will also be shared with incoming president Dr. Paula A. Johnson to introduce her to all things uniquely Wellesley and to welcome her into the community. One of the first invitations to share welcome wishes was through an email that went out to the community. Kathy Byers '67 responded with, "Welcome to Wellesley, where so many women have found their calling and started to make a difference in the world. Our sisterhood is strong and we welcome you to it. May you have a wonderful tenure at this truly special place." Brittany Lamon Paredes '15 wrote, "Wellesley College provides a unique and unparallelled environment for women's empowerment in the realm of higher education." She then encouraged President Johnson to use her first year "to understand what comprises the culture of Wellesley College. Pinpoint the heritage of the college and what the students hold dear to them." Alumnae are also submitting favorites and well wishes via social media using the hashtag #WellesleyWelcome. A "welcome wall" on the microsite now displays well-known traditions (like Step Singing and Hoop Rolling), places (like Tupelo Point, Lake Waban, and Severance Green) and events (like Convocation). Some of the other favorites, like "Pompadour Pudding" or "having a boy in your room with one foot on the floor," are a reflection of the time during which the author attended Wellesley; some are a bit more contemplative, like the alumna who wrote about appreciating being challenged “to think deeply about a subject,” or another who wrote about the feeling of “inclusiveness;” and still others are related to foods, especially Peppermint Pie and Fudge Cake. While it would likely be impossible to define exactly what it is that makes Wellesley, "Wellesley," this collection of favorites will give President Johnson a glimpse into why Wellesley has had such a lasting impact on generations of women, why the community is so excited to welcome her, and why the alumnae community is so passionate about supporting the College. There are many ways to welcome. 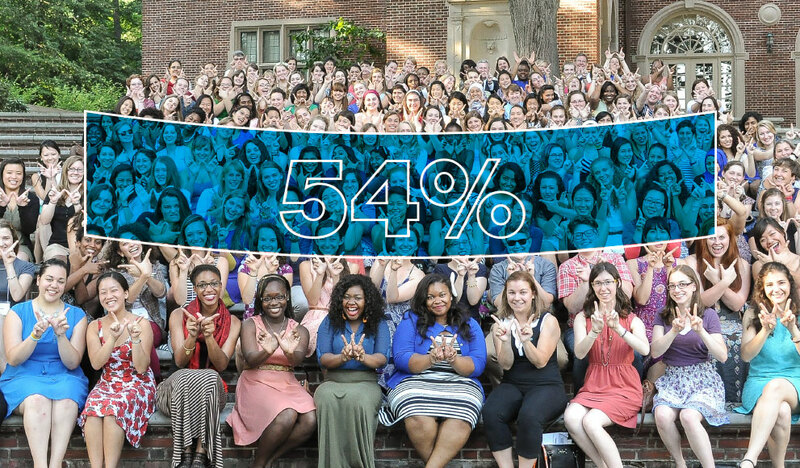 Earlier this week, the College sent an email inviting alumnae to rally together and reach historic heights by achieving a 54 percent giving participation rate before President Johnson arrives on July 1. A high participation rate, which is determined by the number of alumnae who make a donation to Wellesley in a given fiscal year of any dollar amount, also factors into rankings, like those in U.S. News & World Report. High participation sends a strong message about our vibrant and committed network. Join in the giving to support the often shared sentiment that "other people go to college for four years; [but] with Wellesley it's for life!" Visit wellesley.edu/wellesleywelcome to join the momentum, share a favorite, track progress, and help spread the word.